This 25’ Colonial Revival-style townhouse is an incomparable opportunity. With almost 10,000 above-grade square feet, this property offers lofty ceilings, original details, and plenty of sunny outdoor space. Located a few feet from Central Park, this 5-story, elevator Upper West Side Townhouse is currently configured as ten one-bedroom apartments and one medical office. The apartments feature decorative fireplaces, original woodwork, original parquetry and extra studies, nurseries, and alcoves. Two of the apartments include extremely large, sunny terraces, providing over 300 square feet of additional outdoor space. Although this building lies within a historic district, according to Property Shark F.A.R. it also comes with 15,600 square feet of buildable area! Note that actual buildable square footage is determined by a number of factors, so buyers should get an architect’s opinion. The 2000 square foot below-grade space is also profitable, housing a fully compliant basement apartment and rear garden. Only two of the building’s units are currently rent-regulated. 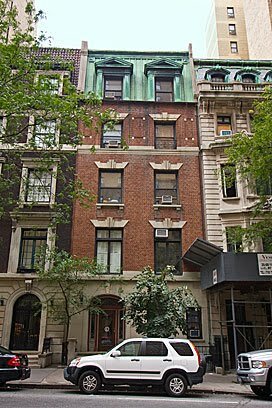 A fun fact for history buffs: this Upper West Side townhouse was once owned by the Straus family, longtime owners of Macy’s department store. Ida and Isidor Straus perished in the sinking of the Titanic the year before their daughter, Sara Straus Hess, bought this property. Sara’s husband, Dr. Alfred Fabian Hess, worked out of the doctor’s office on the first floor for twenty years. While living in this house, this great scientist made watershed advances in medicine: he co-discovered Vitamin D, discovered that rubella was caused by a virus, discovered that Vitamin C cures scurvy, and was the first doctor to use blood inoculation to prevent mumps. Are you interested in buying this Upper West side Townhouse? For more information on NY townhouses and New York City Brownstones for sale , contact Vandenberg — The Townhouse Experts TM. We specialize in townhouse realty.